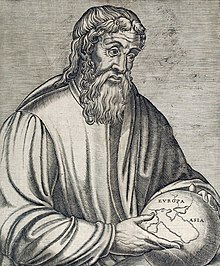 Strabo (/ˈstreɪboʊ/; Greek: Στράβων Strabōn; 64/63 BC – c. AD 24), wis a Greek geographer, filosopher an historian. ↑ Strabo ("squinty") wis a term employed bi the Romans for onyane whose een wur distortit or deformed. The faither o Pompey wis called "Pompeius Strabo". A native o Sicily so clear-sichted that he could see things at great distance as if thay wur nearby wis an aa cried "Strabo." This page wis last eeditit on 6 Februar 2017, at 18:52.